The first handgun mounted weapon light I can remember seeing was almost 20 years ago and it was hanging off the bottom of an HK USP.Â I remember thinking that it was the coolest thing I had ever seen and fell in love with the gun and the light.Â Fast forward to today and I still love the USP and its innovative rail system that is molded into the polymer frame.Â If not for this innovation the Glock 22 I carry for work wouldn’t have the rail it does, and I wouldn’t have a light hanging from it either.Â But this article isn’t about the USP or my Glock, itâ€™s about training with a weapon mounted light. In the past, carrying a weapon with a light mounted to it was typically only a MIL/SWAT thing.Â Now it’s common to see them on regular patrol officers and even private citizen’s weapons.Â Personally I think it’s great as long as you realize that it is not as simple as sliding the light on your weapon and forgetting about it until it is time to use it.Â Consideration must be given to what light you choose as well as how much you train with it to develop the muscle memory necessary to effectively use it when everything hits the fan and you find yourself in a stressful life or death situation. The first thing I want to talk about it light selection. In a previous article I talked about lumens and what I thought was necessary for a do it all light.Â I still stand behind my 200 lumen recommendation – stay at or below that level of light output.Â The specific type and brand of light you choose is usually going to be a personal choice but consider a light that can be operated from either side of the weapon and stay away from pressure switches on handgun lights (more on that in a bit).Â If you stick to a one of the more popular brands like SureFire or this INFORCE APL you really canâ€™t go wrong. So now you’ve picked out the latest and greatest in weapon lights to mount on the bottom of you handgun.Â How often do you actually train with it? 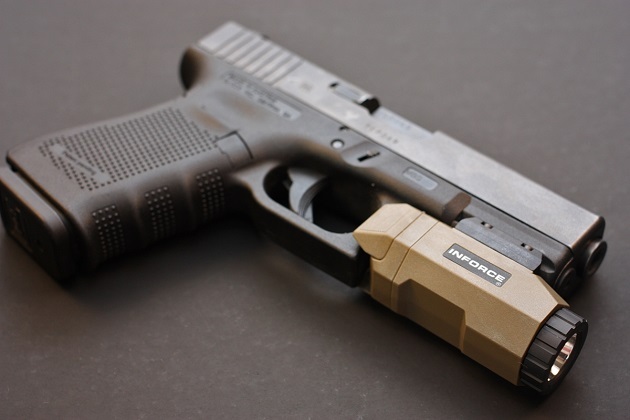 A lot of things can happen once you stick that piece of plastic or aluminum on the bottom of your gun.Â Did you know that some early versions of the Gen 3 Glocks would malfunction when a light was mounted? This was very well documented in the LEO community and I ended up changing a few hundred magazine springs at my department when we went to weapon mounted lights.Â It didn’t affect all guns but do you know if it causes any issues with yours? Training with it will give you that answer. The other thing that training will do is increase your comfort level on activating the light.Â I see a lot of people activate the light with their trigger finger.Â In my opinion you should apply the â€œkeep your booger picker off the bang switchâ€ principal to a light as well.Â We call it a trigger finger for a reason – it goes on the trigger.Â It isn’t to activate a light or do anything other than pull the trigger. Â Instead, I believe you should activate your light with your weak hand. My preference is to use the thumb of my weak hand to activate my light.Â It can be a little more awkward than using your trigger finger at first, but actually training with the light will help you overcome it.Â This is something that can be done with dry fire practice.Â Unload your weapon, double check it to be sure, and put the ammo in a different room.Â Once you’ve done that go through repetitions of drawing your weapon and activating your light.Â This will get the repetitions in that you need to develop muscle memory.Â Follow that with actual range time with activations. The last thing I want to mention is a pressure switch. Whatever you do stay away from any pressure switches on a handgun! The reason I say this is because of sympathetic muscle response.Â In a stressful situation attempting to activate a light via pressure switch like the one offered by SureFireÂ for the X300 can cause you to pull the trigger and not even realize you did it. During stress your muscles are in stupid mode and your fine motor skills are gone. The squeezing motion of your non trigger fingers can cause the trigger finger to follow with a similar motion. Back in 2011 a Plano, TX officer shot a suspect while he was trying to activate the light on his weapon via pressure switch mounted below the trigger guard.Â The official word from SureFire was they were in use by other agencies and never had an issue but they would never admit that the design was a very bad idea. Several news stories I read talked about the lack of training on the light so it illustrates the importance of training with something.Â However, I donâ€™t believe any amount of training can overcome bad design and strongly recommend that a pressure switch be completely avoided on handguns. In closing, whether you are going to carry with a weapon mounted light or without, get some training from a qualified instructor, and practice your skills on a regular basis. I never considered using my weak hand to activate my X300…interesting. Good write up. Great write up!!! I was at the range with my light mounted just the other week. I had a hard time explaining to my wife why we should be practicing with it attached, but I ultimately just told her I wanted to do it because I wanted it to become natural and instinctive to shoot it with the light attached. ~~I would also recommend that users check the batteries every couple of months, and possibly replace them every 6 months or so. The last thing I want to worry about is a dead battery when I need it the most. I too never considered using my off hand to acctivate the light. Now I know why I follow this blog. Great article. This is the one realm that I have always felt I need more training in. Police Departments really don’t like teaching their cops at night for some reason. I think I’ve had one or two training sessions in about 9 years, where we actually did low-light/no-light shooting.. In response to the second to last paragraph, specifically: “During stress your muscles are in stupid mode and your fine motor skills are gone.” Have you done any research on the subject? I have. I had a year long research paper I conducted on the subject while working on pre-requisites in college. What all the research pointed me to, was that if you train an action, you’ll be able to perform it. When under stress, if your muscles are in stupid mode and your fine motor skills are gone, how can you: release a service weapon from a retention holster (level 1 to level 3 all require fine motor skills), press a mag release, reload, align your sights on a target, clear complex malfunctions, or even pull a trigger? You can do all those things. Why? Training. Last paragraph, Re: training: If your finger is outside of the trigger guard, and properly indexed somewhere else, how can an overflow reaction/startle response cause the gun to be discharged? It can’t. The only way that suspect was shot, was if the officer had his finger on, or around the trigger, which is 100% a training issue. Could the gear have compensated for a training/user failure? Possibly, but that doesn’t mean that the equipment is at fault. That being said, excellent article encouraging training with a WML. Cole, I am a little late in responding as I just now noticed your comment. First, I can’t say that I have conducted my own research on the matter. What I can say is I have 10yrs of experience of both field and training and have read research of others such as S.L.A. Marshall and Bruce Siddell on the matter. When I say your muscles are in “stupid” mode I don’t mean they are completely gone so you are able to perform tasks such as clearing a holster, reloading, etc. Training will make your more efficient at it but you will not be as fast as you are in a non-stressful situation because your muscles are not working as effectively due to vasoconstriction, etc. This is something I have experienced first hand and I can tell you that sight alignment is a lot harder in these situations (as are other other tasks) than it is standing on a range where there is no chance of being killed by a paper target. That’s why “front sight, front sight, front sight” is beat into cops and military when it comes to firearms training. Second, I never said his finger was outside of the trigger guard and I am not going to Monday morning quarterback the officer on that as I was not there and there and don’t know the situation and why his finger may have been inside the trigger guard. Yes it could have been a training issue but any design that allows for any kind of startle response needs to be avoided. Thanks for the response, I apologize if my comment seemed condescending, looking back at it, I may have been rude and didn’t intend to. Sorry for jumping on you, I’m so used to blogs posting regurgitated information from Cooper or Massad Ayoob that has been passed around the tactical community and taken as absolute truth. I can now clearly see you’ve looked into the subject, and come to your own educated decision. You brought up some valid points and part of that is my fault for not explaining a term I used. I try to avoid cop talk and keep things simple and not too long when I write about something and at times not being descriptive enough can cause some confusion. As far as the regurgitation goes I don’t think you will see much of that here. I think we have a well rounded group of contributors and Brandon runs a great site. We might not have the rock star status of some of the folks in the gun community and I am ok with that. Just because some popular trainer says something in a magazine or throws together a well edited YouTube video does not mean I buy into it or start adopting that it is the new way to do things without testing it out myself. Im not against change but as my grandfather always said… there is more than one way to skin a cat. Great points about using mounted lights. Most low light situations should be handled with a hand held flashlight and the mounted light should only be used when you know that there are not any bystandards around. Thanks for the article.